Most orders are shipped in 2 to 5 business days and shipping takes another 3 to 5 business days. For large volume orders and orders with items that are larger than 60 inches, shipping could take a couple days longer. If you place the order today, Apr 20th, you should receive it around Apr 30th. If you are ordering more than 30 canvases or frames or wood panels, please contact us. Is there a tracking number for my package? Yes, when your order is shipped, we will send you an email with the tracking number to track the status of your package. What is the price and shipping fee for a canvas size .....? For pricing, please go to the product ordering page and select the size or frame you need. Prices will change base on the size and/or frame you selected. Currently, there is a free shipping promotion so the price you see is the final price with shipping and delivery. What is the texture and weight of the canvas? We use the medium texture, heavy duty, professional grade canvas made from 100% cotton canvas and doubled primed with acid-free acrylic gesso. Canvas weight is 11.5 oz. Do you sell linen canvas or black primed canvas? Yes, please contact us for prices and availability. Can I use your canvas for oil painting or acrylic painting? Our canvases can be used for both oil painting and acrylic painting as well as pastels and watercolor. 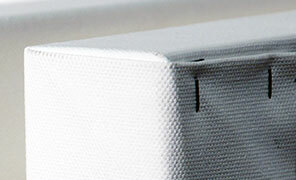 How thick is the frame on the canvas? or what is the depth of the canvas? 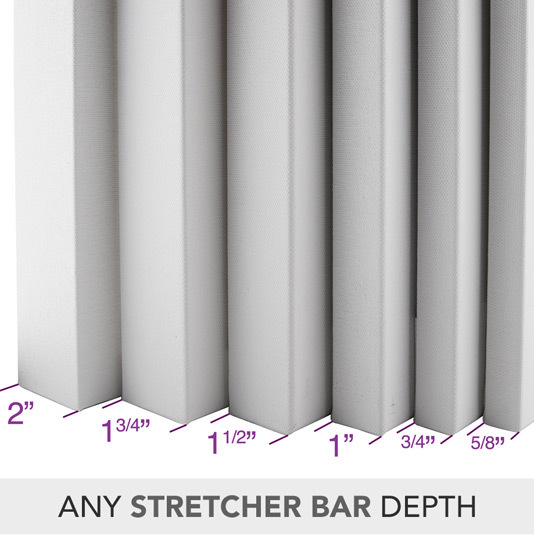 We have many sizes to choose from in the stretcher bar selection. When you selecting the stretcher bar size, that is the thickness/depth of the canvas you are getting. Do the canvases and frames come with hanging wire? All small size canvases and frames come with metal hanging wire attached to the back. For larger canvases or frames (42x42 or 60x32 or larger) we will pre-installed D-Ring hanging hardwares since hanging wires are not ideal for larger canvases or frames in term of leveling and stability on the wall. Can I pick up my canvas order from your location if I live in Texas or nearby? At this time, we do not have dedicated staff to support pick-up orders or walk-in customers. All of our orders have to be placed on the website and get shipped out. We accept all major credit cards and debit cards: Visa, MasterCard, American Express, JCB, Discover, and Diners Club. We also have financing option available. See next question below. How do I apply for financing service for a purchase? Buy now and pay later in monthly installments. This option is available for any purchase total of $99 or more. We partnered with Paypal Credit to offer this service for our products. You can go here to get pre-approved and then contact us to place the order with our customer service team using your approved credit. 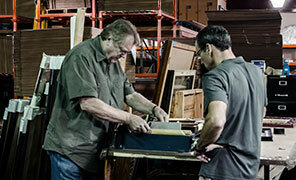 CanvasLot takes great pride in the quality and craftsmanship of our products. Attention to detail in design, materials and packaging is always at the forefront. 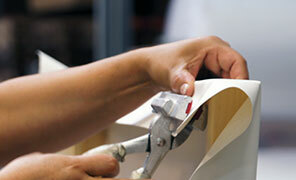 Every item is carefully inspected before leaving our facility. Please inspect the product upon receipt or within 24 hours upon receipt. In the event that damage occurs in transit, please contact us within 2 days of delivery. We cannot file a damage claim if you notified us after 2 days of delivery. Upon return, all item(s) will be inspected. Appropriate exchanges, credits and refunds will be issued for the purchase price of the item(s). Shipping and delivery charges are nonrefundable, and return shipping or pickup fees (from $9 to $149) may apply. If you had upgraded service delivery or received free shipping special, the actual cost of shipping will be deducted. Returned item(s) need to be repacked in its original packaging including interior packing. In addition, a material and restocking fee of 25% also may apply. Orders eligible for cancellation will be refunded in the original form of tender. 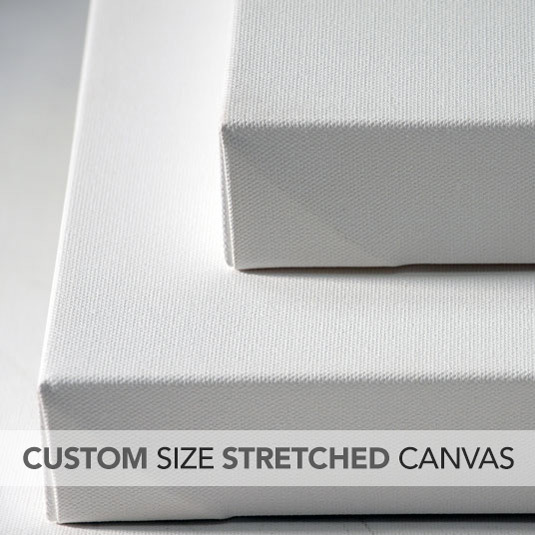 Get the exact size you need for a custom stretched canvas. CanvasLot is one of a very few companies that can build and ship custom sized and X-Large canvases nation wide. 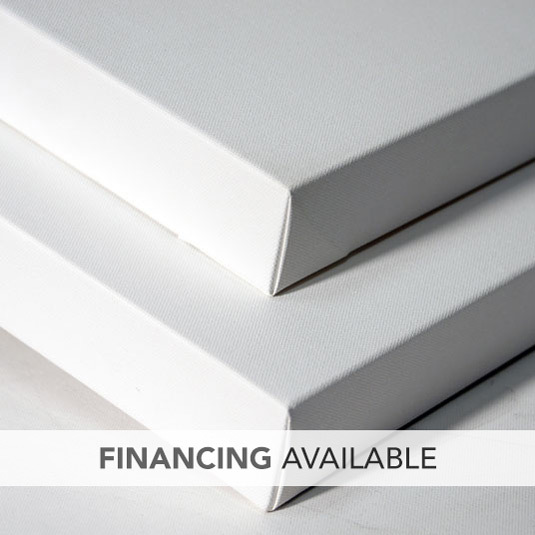 It has never been easier to buy odd size blank canvases and select from many different stretcher bar depth (thickness) you need and have it delivered right to your door step. Every artist canvas and frame that we sell is done in house from sizing and assembling to stretching and packaging, even the box that we used to ship the canvas is designed and made by CanvasLot. We are the manufacture and retailer for all of CanvasLot products. 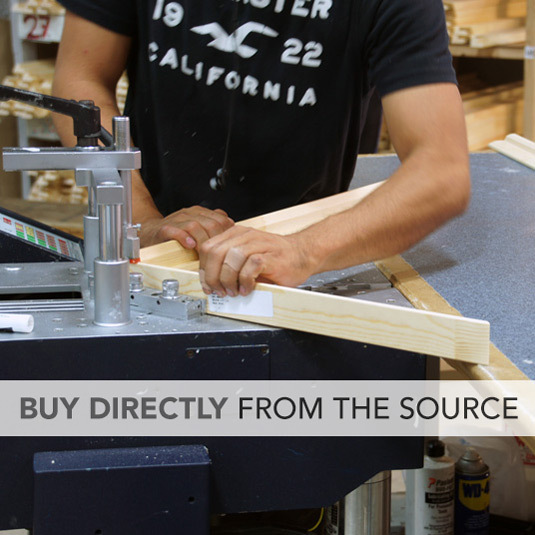 Buying directly from the source allows you to have true quality at the best price. 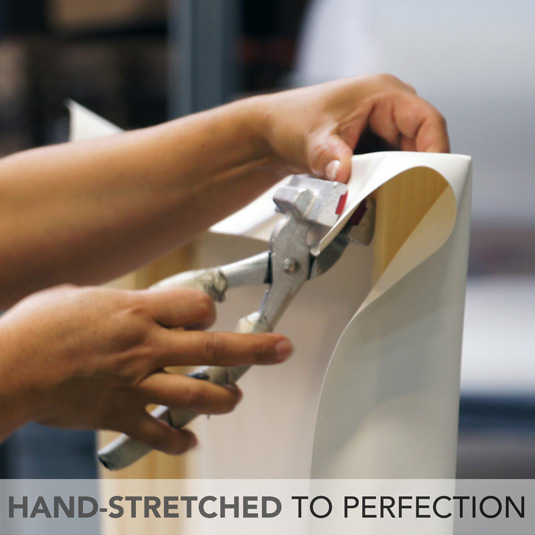 All of our blank canvases are gallery wrapped & hand-stretched to perfection. The canvas material we use is the same type of heavy duty canvas that professional artists use: the 11.5 oz premium grade double primed cotton canvas. These canvases can be used for both oil painting and acrylic painting as well as pastels and watercolor. Our canvases are back-stapled only for a classic gallery look, even though this process takes more canvas and more time than the canvases that are stapled to the sides that you often see. 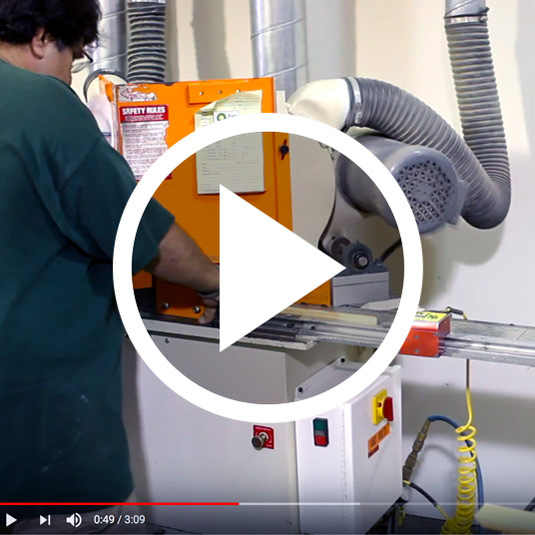 We takes great pride in the quality and craftsmanship of our products and will always avoid shortcuts that will sacrifice the quality. 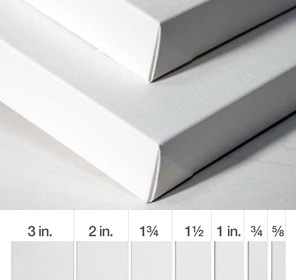 CanvasLot canvases are made from 100% cotton canvas and doubled primed with acid-free acrylic gesso ready to be painted on. How the paint reacts to the artist canvas surface is what really matters. 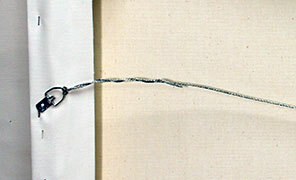 The canvas also comes with metal hanging wire, ready to hang when your masterpiece is completed. * Note: unless specifically requested, oversized canvases will come with metal D-ring hanging clips only, WITHOUT the hanging wire, since it is not ideal to hang an oversized canvas on a wire.